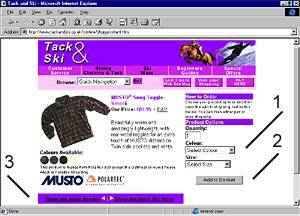 Shopping at Tack and Ski is Quick and Easy. 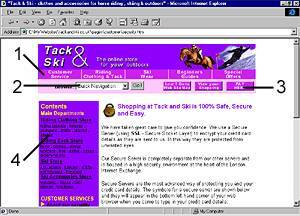 To move between the Riding and the Ski Departments click the buttons marked 1. You can also get quick access to Customer Service, Beginners Guides and Special Offers from here. These buttons are across the whole website. If you want to go to a specific product look for it in the Quick Navigation marked at 2 and then press go. You can Pay at any time or view your Shopping Cart or look at the Web Site Map by pressing any of these buttons marked at 3. Finally you can use the purple bars down the side of pages to quickly jump from section to section (4). Once you have selected the product you want to buy you must select a colour and a size (1). Then you can add it to your virtual Shopping Basket by clicking on the button marked at 2. Clicking on this button does not commit you to buy it. You can remove any product at any time. If you want to look at similar products on a screen use the buttons at the bottom as shown at 3.